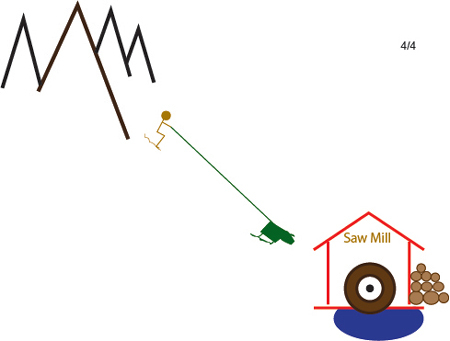 So, the obvious solution was that Paul grabbed a hold of the river up in the mountains by the loggers and Babe went to the saw mill and grabbed a hold of the river there! Then they pulled mightily and at last the river straightened out… in one big, successful project! All of the logs flowed smoothly to the saw mill (without ever overwhelming the mill), and the loggers got paid for their last 6 months of work! Can’t you just see the ad to recruit this guy on monster.com? WANTED: experienced hundred-foot-tall ”Get-it-done” proven leader who hangs out with a 50 foot tall blue ox to straighten out our flow problems! Yep… it is legend… and that’s all!